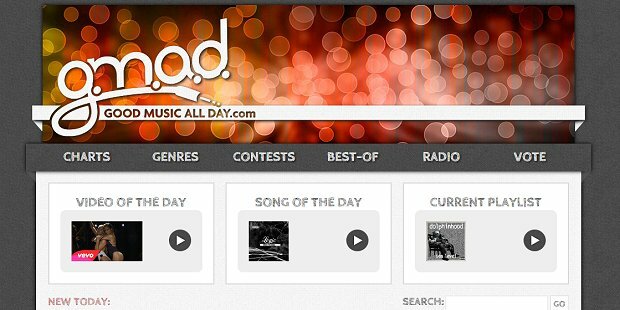 Good Music All Day champions up-and-coming electronic artists. A quick, basic search will show you that there's absolutely no shortage of blogs focused on electronic music – dubstep, drum and bass, glitch, and more. But, that abundance makes it harder to separate the mainstream-minded from those that champion up-and-coming acts. Here are five well-read sites that reliably promote the latter, and feature just about every subgenre of electronic music. Nice, right? Why we love it: It's a decidedly not-for-profit blog curated by a handful of college-aged music fans from all over the country, so coverage is diplomatic and varied. Readership extends beyond the US, though, to about 240 different countries every month. GMAD isn't strictly an EDM blog, but it features up-and-coming, established, and totally unheard of acts regularly. Plus, there's always an opportunity for extra accolades on its charts. How to get featured: Submit through its voting system. Readers show approval with a thumbs up or down, and, no surprise, the highest-rated bands get press. Why we love it: While established acts are featured regularly, there's also a clear emphasis on bringing unique, generally unknown acts to light. In their search for new gems, the writers scour not only the internet, but also the festival circuit – and not just the massive events and their headliners. ElectroJams' simple setup is a nice relief in a genre where blogs tend to over-categorize. Readers can search by tags (dubstep, drum and bass, etc. ), or just browse from the main page. How to get featured: Use the contact info available here. There's no direct request for submissions, but considering the spirit of the blog, it's unlikely it doesn't want them. Why we love it: The blog's mission to promote undiscovered bands is stated plainly and proudly. On Saturdays, electronic artists get an extra push via the Electric Saturdays series. Though based in Washington D.C., the breadth of coverage is vast. How to get featured: The regulations for submissions – which are welcomed – are here. Why we love it: Peanut Butter and Jams is adorable, both for its name and because it was founded by two best friends (aww) who met in college in 2010. Their obsession with bringing new music to light led them to start this frequently updated blog, which boasts a readership that spans the globe. Track features, playlists, video posts, and interviews are all part of their stylishly designed site. How to get featured: Email them directly – they'd love to hear from you. Why we love it: Despite being relatively new (it launched in 2013), this blog is incredibly organized and, as a result, quite powerful. Underground artists are its focal point, and it has college reps in place that help further spread the good news of the blog and the artists it features. Electronic and dance are split on this one, though, so be specific about which category you fall under when you submit. How to get featured: This is the only blog without clear-cut submission guidelines, but don't let that stop you. Try reaching out on Twitter or in the comment section of a related post.